1. Bucket Elevator has characteristics of large transport capacity, high elevation, stable operation and long working life. 2. the machine is applicable for conveying the powder, grain and small block materials, such as coal, cement, block, sand, clay and ore.
3. Bucket Elevator is allowed to convey materials with high temperature(250°c) when armed with special chain structure, and the elevating height can reach 40m. 4. It has vast range of application with almost no limitation for lifting material forms and properties. Materials like power, grain or big lump could be all applicable. Also its good sealing condition could effectively reduces the environmental pollution. 5. Excellent running reliability. 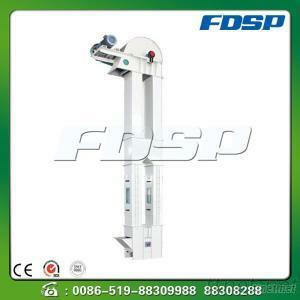 Advanced design and processing method ensure the running reliability of the complete machine. 6. Long service life. the design of this machine ensures that the materials is seldom scattered while feeding and discharging, which reduces the mechanical wearing.